GACE Series – Georgia Assessments for the Certification of Educators: The GACE series is a group of exams created by the State Board for Educator Certification (SBEC) and administered by the Educational Testing Service (ETS) that are designed to determine whether or not an individual has the knowledge necessary to be an entry-level educator in the Georgia public school system. These exams assess an individual’s general and specific teaching skills and are required in order to become a certified educator within the state of Georgia. The GACE series includes a wide-range of exams related to specific educational topics as well as exams related to specific careers within the educational system. GACE exams cover specific topics such as art, dance, computer science, chemistry, English as a second language, English language arts, health, history, journalism, mathematics, music, physical science, social studies, and other similar topics. There are also specific exams within some of these topics intended for individuals interested in teaching certain grade levels. Certain GACE exams also cover specific professional positions within the educational system such as exams for becoming a principal, reading specialist, school counselor, and superintendent. Each GACE exam usually consists of somewhere between 90 – 150 multiple-choice questions, but some tests also include essays, short open-ended responses, and other similar types of questions. In order to take the exam with a bachelor’s degree or higher, you must apply to receive a temporary teaching certificate from the SBEC. If you meet one of these three requirements, you can register with ETS online, by phone, or by mail. The registration fee for any exam (except for the superintendent exam) is $82. The registration fee for the superintendent exam is $164. The exact GACE exams that are required in order to become a certified educator within the Georgia school system varies depending on the specific type of position that you are interested in pursuing. There may also be other exams and fees that are required in addition to those associated with the GACE exams in order to be certified in the particular position that you are pursuing. The Georgia Assessments for the Certification of Educators (GACE) is Georgia’s assessment program for prospective public school educators. It costs $78 for a single Program Admission test. To take any two PA tests together, the fee is $103. The fee for combined PA tests is $128. Scores for the GACE are reported within 7 days after the test date. A passing score for the GACE can differ slightly. The range is 220-249 to pass at the induction level and 250 to pass at the professional level. You must wait at least 30 days after your initial test date to retake the GACE exam. How many questions are on the GACE test? The GACE test usually consists of somewhere between 90-150 multiple-choice questions. Explore our free GACE review provided by Mometrix. 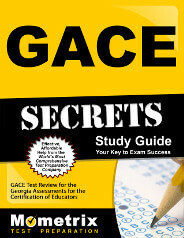 Check out our premium GACE study guide to take your studying to the next level. If you benefit from these materials, just click the link below! 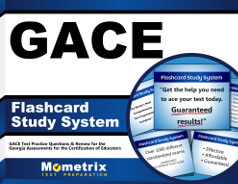 To compliment our GACE book, we also offer extensive flashcards for even more GACE test prep help. We hope you enjoy our products! Your purchase helps us make more great, free content for test-takers just like yourself.